Well, we're a year in to this newsletter. Can you believe it's already been going for that long?! As per a few requests, I have some more book reviews and recipes coming to my blog over the next few months, to help you improve your thyroid health further, and my second book is also coming along nicely. As I've touched on before, You, Me and Hypothyroidism is going to be for thyroid patients' other halves, spouses, friends, family etc. and aims to educate them on what they can do to support the person with hypothyroidism in their lives. I'm not sure when this book will be out yet, but I'm hoping by the end of this year. So stay tuned! I was interviewed by The Butterfly Effect Blog recently too, and you can find the chat we had below. The questions were great fun to answer and I hope it has helped to reassure other thyroid patients that they are not alone. Victoria is a great thyroid advocate and writer too. We're now well in to March too, Autoimmune Disease Awareness Month, which is a great opportunity to raise awareness on autoimmune thyroid disease, such as Graves' and Hashimoto's. Miss Lizzy Thyroid Support is a trusted source for thyroid health information and iodine products that have helped many hypothyroid patients. Her products Lugol’s Iodine Solution and Lugol’s Iodine Tablets offer not only support for symptoms of hypothyroidism such as cold hands and hair loss, but may increase energy and metabolism. In patient testimonials, iodine supplementation has even helped with mental focus, stronger nails, dry skin, breast health, mood, and more. In this article, Miss Lizzy advocates how iodine supplementation is vital for thyroid function. 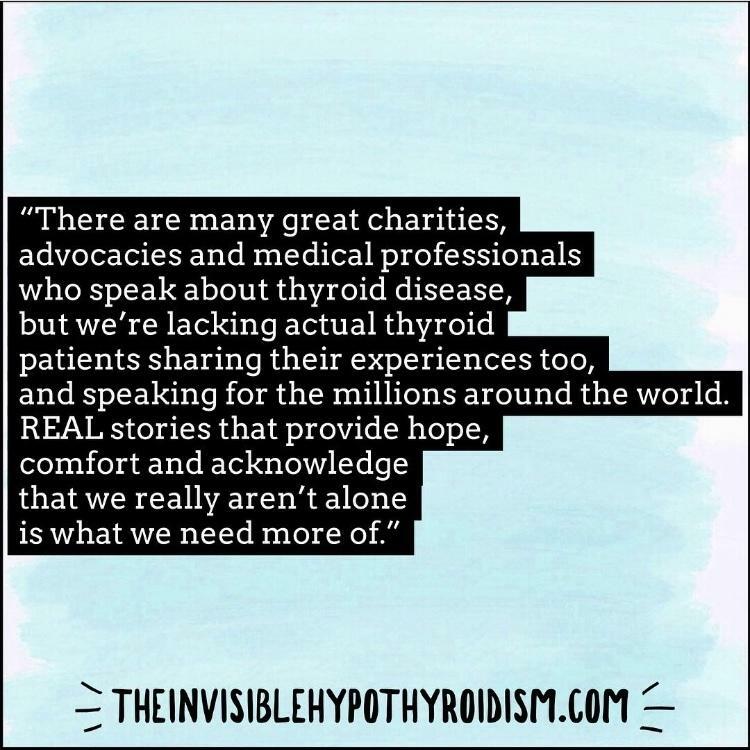 The Invisible Hypothyroidism, as well as many other thyroid advocacies and websites, were featured in this comprehensive and interesting article by Health Rising. It looks at approaches and success stories of T3 being used in the treatment of Chronic Fatigue Syndrome/ME and Fibromyalgia. I was interviewed by Victoria of The Butterfly Effect Blog about my own experiences as a thyroid patient, self-sourcing my thyroid medication, getting my Hashimoto’s in to remission, forming my blog, writing a book and more. The questions were really fun and we had a great chat! Another book I'm writing the foreword for is on preorder now. The End of Chronic Fatigue, written by Zana of The Thyroid Code will be out in a few months' time but you can find it on Amazon already. March is Autoimmune Disease Awareness Month, which is important and relevant to many with hypothyroidism, as 90% of the cases of hypothyroidism are caused by the autoimmune disease Hashimoto’s Thyroiditis. Yet a lot of people still do not seem to know if their hypothyroidism is of the autoimmune kind! For those living with a thyroid condition such as hypothyroidism or Hashimoto’s, these items can make up a care package that can be given in person or even sent in the post, to let someone know you’re thinking of them and want to do something to show you care. I hear from many thyroid patients living with brain fog and fatigue, asking me for tips for remembering to take all their medications and supplements. Marc Ryan’s book provides a combination of functional medicine and traditional Chinese medicine, in treating and managing Hashimoto’s. The Thyroid Family is a brilliant community which aims to provide you with support, advice and a safe and welcoming environment for you to meet others going through thyroid issues too, and learn together. It will also empower you on to your journey to better health with thyroid disease. "I tell thyroid patients to keep trying different doctors until they find one they can build mutual respect with. One who will listen. I tell them to write down everything they want to say so that the intimidation of a trained professional doesn’t make them forget anything. I explain to them that you’re best working together as a team and let them know that you want to be a partner with them in your healthcare. After all, you are an active participant in your own health."